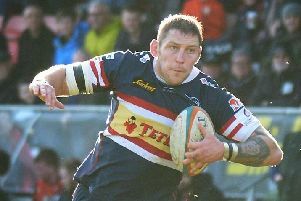 Doncaster Knights boosted their hopes of a third consecutive top-four Championship finish with a 48-38 win over Hartpury at Castle Park. It is the first time this season that the club have won three successive league games but they could have paid a high price. Fly-half Declan Cusack picked up what is feared to be a serious knee injury shortly after coming on as a replacement in the final quarter. “We will know more after Declan has had a scan but it’s not looking too good,” said director of rugby Clive Griffiths yesterday. With all the replacements having been used, Knights, who also had Tom Hicks sin-binned earlier in the half, had to play out the last 15 minutes or so with only 14 men. But that still didn’t stop the Welshman being critical of the Knights defence in the build-up to Hartpury’s last try - just as he was with Mike Wilcox’s second-minute score and the try scored by Steve Leonard after wing George Perkins was allowed to catch the ball from the restart following Ben Hunter’s second touchdown and break down the right. “You should never been happy to concede 38 points at home and some of our one-on-one tackling was poor and that’s something we’ll address this week,” said the Welshman. “They put 39 points against Nottingham last time out so we didn’t underestimate them. But it was still disappointing as we had defended well in recent games. “On the other side of the coin we picked up five points and scored eight tries all of which created ourselves. “Several of them were from rehearsed moves at the lineout and others were well-executed longer-range efforts.